The Liebherr LTM 1750-9.1 is the latest addition to the all terrain crane range of Liebherr cranes in Ehingen. It was shown in iron for the first time during the official Liebherr crane days in June 2012. The LTM 1750 back then was part of the dynamic crane presentation in the Ehingen plant and was also on display on the crane parade in Breuer & Wasel painting. The Liebherr LTM 1750-9.1 is a telescopic mobile crane with a 52 m long main boom. The maximum lifting capacity is 750 metric tonnes at a working radius of 3 m. The maximum lifting height of approx. 156 m can be reached with the use of 91 m luffing jib and an additional 10 m telescopic boom extension. Also available is a fixed jib with a maximum length of 62 meters. The Liebherr LTM 1750-9.1 is destined to fill the gap between the 500 t Liebherr LTM 1500-8.1 and the 1200 t Liebherr LTM 11200-9.1 all terrain cranes. Other than his predecessor in its capacity class, the LTM 1800, the LTM 1750-9.1 can travel on public roads with the complete main boom mounted. Only the rear outriggers need to be dismounted and require separate transport. The maximum possible counterweight is 204 tonnes. 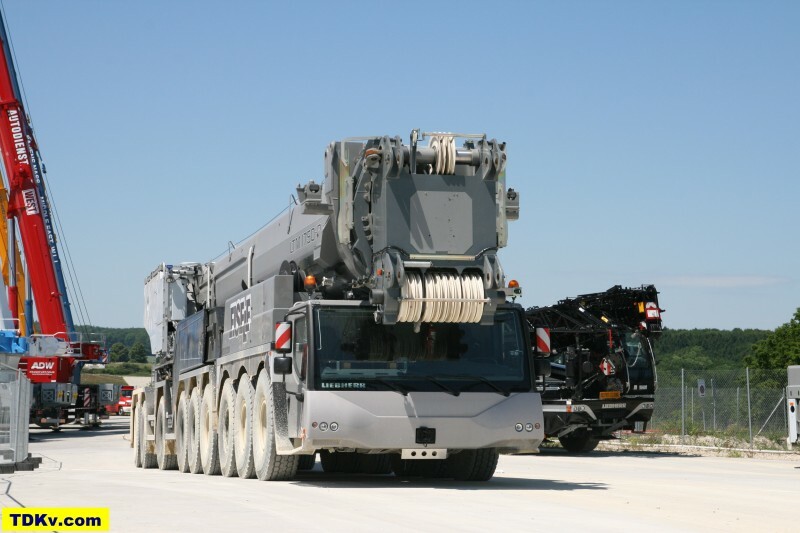 During the Liebherr crane days three LTM 1750-9.1 were on display and several others were already on the assembly line and on the testing field. The presenter of the show has announced the first deliveries of the new Liebherr LTM 1750-9.1 for the beginning of 2013. Beyond this list many crane companies more have already ordered the LTM 1750-9.1 and several names of potential customer are spread by rumours. Officially confirmed are orders from Port Services from Scotland and All Erection and Crane Rental from the US. Last week we have - combined with an order for load charts - received a confirmation from our German crane hire customer Colonia Spezialfahrzeuge from Cologne for the delivery of the Liebherr LTM 1750-9.1 in summer 2013. The list of the recent deliveries gives the impression that the LTM 1750-9.1 will be another very successful Liebherr crane. It is very fascinating to see this quick initial output of the Liebherr crane plant in Ehingen for an all terrain crane of that size.